Titus Grenyer was a second year student at Sydney Conservatorium of Music at the time of this performance. His musical education began with the violin at age three, and soon expanded to studying piano, music composition and theory. In 2013, he was awarded the inaugural IMB Roger Soden Organ Scholarship at Wollongong Conservatorium, which began his career in organ with a recital at the end of the year. 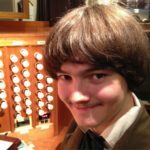 In 2016, he was appointed Organ Scholar at St Andrew’s College and St James’ King Street, and was awarded an LMusA with distinction. He has given recitals at St Andrew’s Cathedral, St James’ King Street, St Mary’s Cathedral, Christ Church St Laurence and the University of Sydney Great Hall. Titus hopes to continue studying the organ for the remainder of his undergraduate studies, and then complete a master’s degree abroad.